I love Indian food. No, I mean I really LOVE Indian food. It’s somewhat of a problem, actually. I think I’d be quite happy moving to Indian and noshing on curries and pakora and creamy rice pudding for the rest of my days. Oh wait, except for that little problem I have with dairy products. *sigh* Oh sure, there are a lot of Indian foods that don’t use dairy. But the creamy curries – they’re my favorites. Never fear, our good old friend coconut milk comes to the rescue again. You’re going to think that we use coconut milk every day. It’s not true. We don’t. It just happens that we’ve had two meals this week that were worthy of sharing, and both just happened to involve coconut milk. You can feel free to make better choices than me, though. Variety is good and all that. 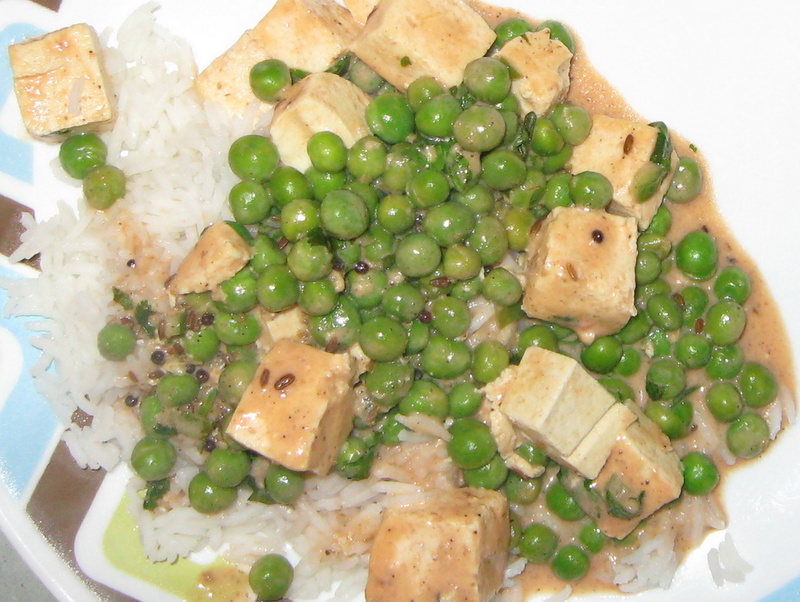 Anyway, this dish is riff on the classic peas and paneer (Matar Paneer) and Madhur Jaffey’s Malaidar Matar (Peas with Whole Cumin and Mustard Seeds) from her book Spice Kitchen. I love her recipes. If you haven’t tried any, I urge you to run out right now and pick up one of her many books. Delicious and rich, we serve this dish over some fresh basmati rice. In a measuring cup, combine the sugar, ground cumin, garam masala, salt, cayenne pepper and tomato paste. Slowly add 2 T. water, mixing as you go. Add the coconut milk and mix. Add the lemon juice, cilantro and jalapeno. Set aside. Heat the oil in a large frying pan over medium high heat. When hot, put in the cumin and mustard seeds. As soon as the mustard seeds begin to pop, add the tofu. Cook for a few minutes on each side (a little browning of the tofu is good). Add the peas. Be careful, the oil will splatter a bit when you do that. Stir and cook for about 30 seconds. Add the spice and coconut milk mixture. Cook until coconut milk begins to thicken. Serve over fresh basmati rice. This entry was posted in Indian, tofu, vegan. Bookmark the permalink. Definitely trying this! I love this dish when we get Indian – only with paneer right? I too love Indian and have been craving it. Thanks for this. Just finally made this! It is so yummy. Just did the taste-test. We did three Indian dishes last night so I made this one today so we can have it with last night’s leftovers. It’s so easy. I didn’t have cumin seed so I used coriander (just winging it!) and I didn’t have jalapeno. Still delish. Thanks Deanna! Thanks Maggie – I’m glad you liked it. I find a lot of Indian food works well with substitutions. Glad yours worked out! Yah, it seems like people either love or loathe Indian food. I love it and could eat it every day. Happily, the kiddo does, too! Go you rebel, you! You’ll have to let me know how it turns out with both.